Creating a logic model is a useful framework to evaluate effectiveness of a program. They can also be used for strategic purposes when planning and implementing a solution, as it assesses the “if-then” relationships between the inputs, outputs, outcomes and impact of a program. 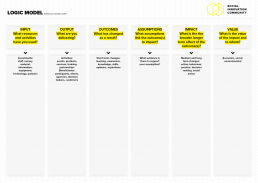 The logic model not only helps you to better articulate and align your activities to your bigger impact objective, it also allows you to spot any risk by identifying any underlying assumptions made along the way. The tool can also be used in team building to allow team members to understand their contribution to the larger mission. The first step in creating your logic model is to jot down what you’re putting into the program: staff time, money, material, information, etc. The second step is to think of what you are delivering and to whom. The next step is to determine the outcome of your investment and activities. Outcomes are short-term changes that result from your solution, such as: learning, awareness, skill development, higher income level, etc. Outcomes should be measurable and tangible. Then skip over the assumptions and write down the impact that your solution aims at achieving, or rather the medium to long term changes in behaviour, culture and social action. Impact should be as measurable as possible. In order to provide a correct analysis, you have to also test the assumptions that link the outcomes to your desired impact. Assumptions should be tested and verified to guarantee that impact is being made. The last step is to define the value of the impact: social, environmental, economic or cultural and to whom.